The systems of units derived from the metric system (CGS, MTS, MKS, MKSA) have gradually been replaced by a single system of units called the International System of Units (SI). The first section of this chapter is devoted to that system. Given that certain countries continue to use the Imperial system with its British and American variations, the second part of this chapter provides the equivalents between Imperial and SI units. This system was devised in 1960 and has gradually been improved through work undertaken by the General Conference on Weights and Measures (GCWM) whose decisions are prepared and implemented by the International Committee for Weights and Measures (ICWM). 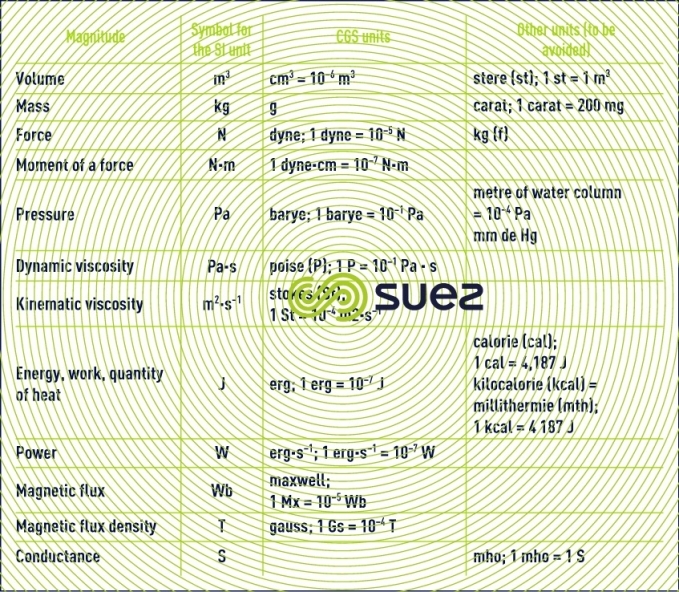 It includes basic units, derived units and supplementary units. Its application requires decimal multiples and sub-multiples, with the appropriate prefixes. In addition to the units listed below, it acknowledges units designated "for use with the International System" and "approved for temporary use". 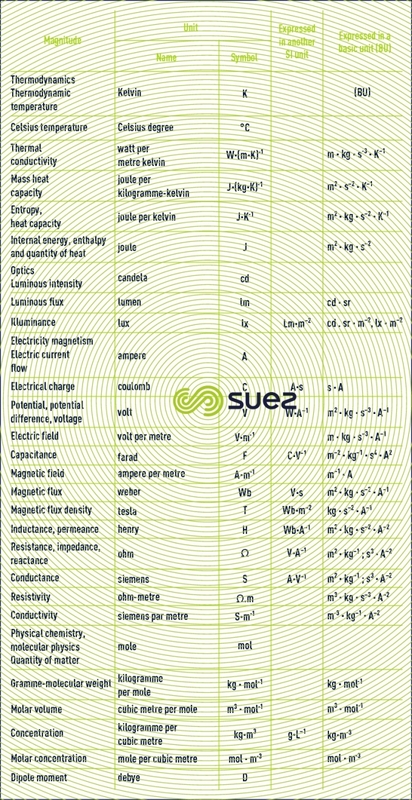 The following tables constitute extracts from the International System concerning units that, for various reasons, apply to water treatment. The first of these units have been taken from documents published by the AFNOR and in particular from the summary table: "The International System of Units (SI)" according to the documentation booklet NF X 02-006 (August 1994). The symbols for the units are only used after a number shown in figures. They must be printed in upright characters, are invariable in the plural, written without a full stop and positioned after complete numerical values, leaving a space between the numerical value and the symbol. The symbols are written in lower case letters; however, the initial letter becomes a capital letter when the name of the unit is derived from a proper noun. Only one single fraction bar can be included on the same line to represent a composite unit that is the quotient of two units, unless brackets are used to avoid any ambiguity. Negative powers can be used in complicated cases but are not compulsory. 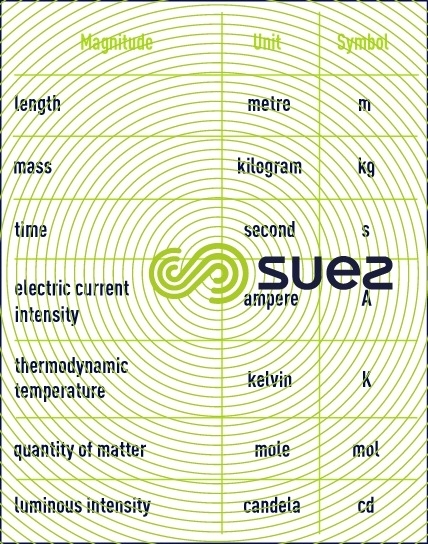 Note 2: the mole is the quantity of matter in a system that contains as many elementary entities as there are atoms in 0.012 kilograms of carbon 12. When using the mole, the elementary entities must be specified and may be atoms, molecules, ions, electrons, other particles or specific groups of such particles.